Yellow Diamond Crystal: Almazy Anabara, an affiliate company of ALROSA, discovered this 34.17-carat yellow diamond crystal at its Ebelyakh alluvial deposit in the Yakutia Region of Siberia, Russia. It measures 20.17 x 19.65 x 15.1 millimeters in size. ALROSA is the world’s largest producer of diamonds on the basis of weight. The company has recently been producing a large number of colored diamonds and hopes to become one of the world’s leaders in the production of colored diamonds. Photograph by ALROSA. Yellow diamonds are diamonds that have an obvious yellow bodycolor when viewed in the "face-up" position. The yellow color is usually caused by small amounts of nitrogen contained within the diamond’s crystal structure. Yellow diamonds with a rich, pure yellow color are the world’s most valuable yellow gemstone . Many people consider them to be the most beautiful yellow gem because of their brightness, fire, and exceptional luster. Large Yellow Diamond Crystal: ALROSA recovered this 98.63-carat diamond with a subtle yellow color from its Jubilee Pipe in the Yakutia Region of Siberia, Russia. It measures 29 x 28 x 27 millimeters in size and is covered with interesting triangular dissolution features. 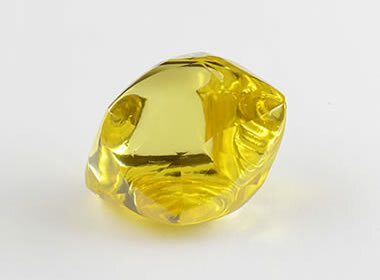 This diamond is an example of a stone with a noticeable yellow color that might not have a strong enough saturation to be considered a "fancy-color diamond". Instead it would be graded on the D-to-Z color scale as a Faint, Very Light or Light yellow color. It would make an excellent mineral specimen. Photograph by ALROSA. Click to enlarge. Isn’t Yellow Color a Bad Thing? On the GIA scale, a grade of "D" or "colorless" is the highest grade. Traces of yellow, brown, gray, or any other color within the gem will cause it to receive a lower color grade on the D-to-Z scale. To answer the question... Isn’t yellow color a bad thing? Not always. Yellow diamonds are a wonderful thing when the yellow color is strong enough to be obvious and attractive when a faceted diamond is viewed in the face-up position. Below grade "Z" at the bottom of the GIA grading scale, a very small number of diamonds have a yellow color that is strong enough to be obvious and attractive when viewed in the face-up position. Fancy Vivid Orangy Yellow: In September 2018, ALROSA surprised the diamond market by auctioning a collection of 250 colored diamonds in Hong Kong. Known as the "True Colours" auction, ALROSA intends to make the sale an annual event. The company reports that they will easily be able to support the annual sale because they produce at least 7000 carats of colored diamonds per year. (All of the diamonds in the True Colours sale were cut and polished by ALROSA.) The stone above is an oval-cut, 15.11-carat, Fancy Vivid orangy yellow, VVS2 clarity gem. 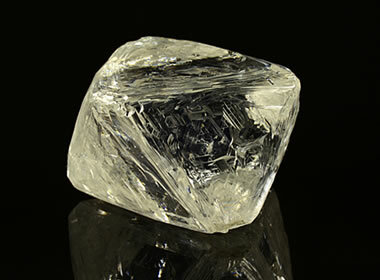 Diamonds of this size and quality are extremely rare. Photograph by ALROSA. 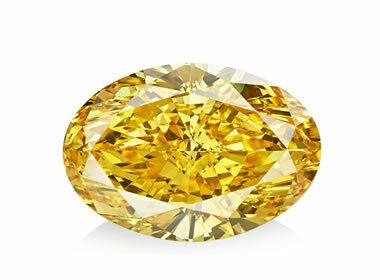 The most desirable color for a yellow diamond is pure yellow. 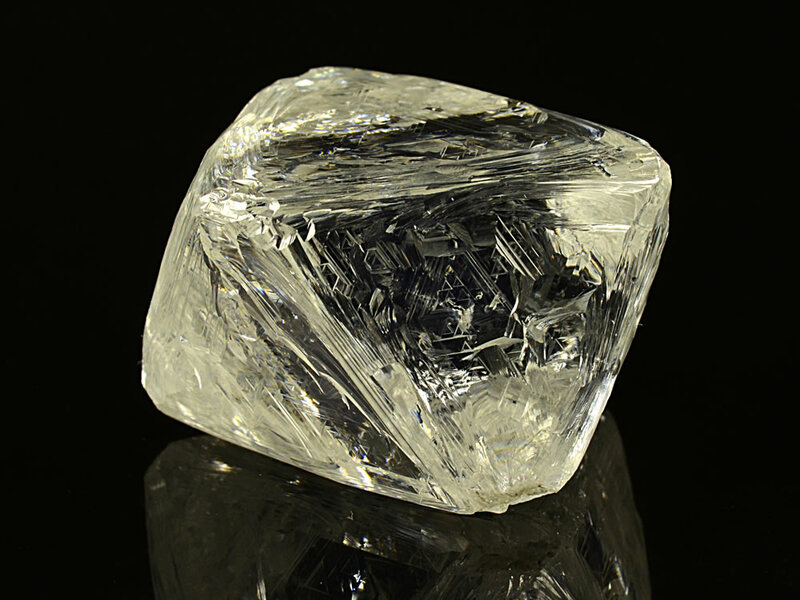 However, most yellow diamonds have at least traces of a secondary color. Greenish yellow and orangy yellow are common modifications of yellow color in diamonds. Diamonds are composed of carbon atoms, held tightly together in a crystal lattice by strong covalent bonds. When they are composed of pure carbon and are without inclusions or structural defects, they are colorless. Nitrogen Substitution in Diamond: This diagram illustrates a single nitrogen atom substituting for a carbon atom in the crystal structure of a diamond. This type of substitution is known as a "C center". This type of defect in diamond can produce a yellow color in diamond with as few as 1 nitrogen atom for every 100,000 carbon atoms. Illustration modified after a Creative Commons image by Materialscientist. 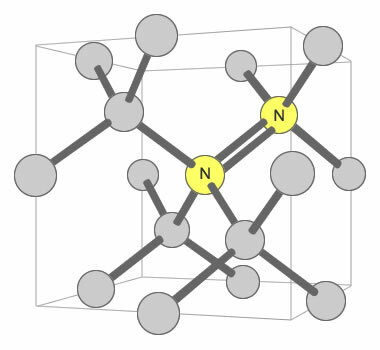 This type of nitrogen substitution produces yellow color in lab-grown diamonds but not in mined diamonds. 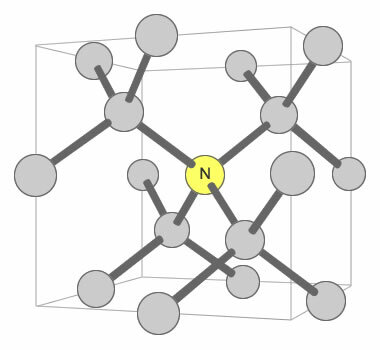 During the long history of natural diamonds, nitrogen atoms usually aggregate into clusters of two or more nitrogens, sometimes combined with a vacant lattice position. Nitrogen Pair Substitution in Diamond: This diagram illustrates two nitrogen atoms substituting for two carbon atoms in the crystal structure of a diamond. This type of substitution is known as an A-nitrogen center. This type of defect in diamond has only a weak impact on the color of the diamond. Illustration modified after a Creative Commons image by Materialscientist. Some types of nitrogen substitution in diamond do not produce yellow color. An example is when a pair of nitrogens substitute for carbons in two adjacent carbon tetrahedrons, with one of them shared by four tetrahedrons. This configuration is shown in a second accompanying illustration. Here, the nitrogen has almost no impact upon the color of the diamond. Two common names used for yellow diamonds are "Capes" and "canaries". The name "Cape" originated in the late 1800s when many diamonds with an obvious yellow color were being produced from mines in the Cape Province of South Africa. They were quickly noticed in the marketplace by diamond professionals who began calling them "Capes" because of their Cape Province provenance. If graded today, many of these diamonds would be light enough in color that they would receive a color grade within the D-to-Z color scale; however, some would be graded as "fancy-color diamonds". The name "Cape" is still used today by many diamond professionals for diamonds of a light yellow color, regardless of their provenance. "Canary" is a name used in the gem or jewelry trade for diamonds with an obvious, usually Fancy-grade, yellow color. The name is imprecise because it is used for yellow diamonds that might be in the D-to-Z color scale, or all the way up through the Fancy colors to Fancy Vivid yellow. The name also does not imply any specific provenance. Fancy Vivid Yellow: This is another diamond from the 2018 ALROSA "True Colours" auction. 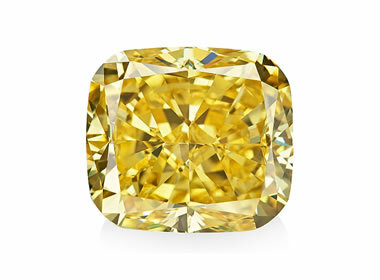 It is an 11.19-carat, cushion-cut, Fancy Vivid yellow diamond of VVS2 clarity. Diamonds of this premium color, clarity and size are extremely rare. Photograph by ALROSA. When buying a yellow diamond for use in jewelry, the color of the metal used in the setting can be important. The first thing to consider is the contrast or harmony of colors that will be present when the diamond is viewed in the setting. The color of the metal can contrast with the diamond and make it stand out in the setting; or, the color of the metal and the color of the diamond can be in harmony with one another. You will have choices of gold, platinum, rose gold and other metals, each with a unique appearance. Your jeweler can provide valuable advice and possibly show examples to inform your decision. The second thing to consider is how reflections of the metal band and prongs will influence the appearance of the diamond. Light reflected from the metal can enter the diamond and reflect from facet to facet to facet throughout the diamond. The color of the setting can have a noticeable impact on the apparent color of the diamond, especially when its tone and saturation are light. Again, your jeweler can be an important source of advice on both the color of the metal and the design of the setting. Yellow diamonds have been produced by treating brownish diamonds. These treatments include HTHP (high temperature, high pressure), irradiation, annealing and coating. Some of these treatments can be reversed or altered if the diamond is subjected to heating during jewelry repair. Coatings are often thin layers of silica applied to the surface of the stone. These can be damaged by abrasion, chemicals or heat. Yellow diamonds that have obtained their color through treatment should always be disclosed and sold for a lower price than similar diamonds with a natural color. The buyer should also be informed of any special care requirements. Many buyers have no interest in treated diamonds. They want gems with a natural color and are willing to pay a premium for them. At the same time, some people are glad to buy a treated stone because it enables them to get a larger diamond for the same price or the same size diamond at a lower price. Secrets of the Gem Trade, The Connoisseur's Guide To Precious Gems; second edition; by Richard W. Wise; Brunswick House Press; 404 pages; December 2016. Characterization and Grading of Natural-Color Yellow Diamonds; by John M. King, James E. Shigley, Thomas H. Gelb, Scott S. Guhin, Matthew Hall, and Wuyi Wang; Gems & Gemology, Volume 41, Number 2, pages 88-115, Summer 2005. Diamond Color Chart: The Official GIA Color Scale; article on the Gemological Institute of America website; accessed September 2018. GIA Colored Diamonds, Color Reference Charts: by John M. King (editor), first edition, Gemological Institute of America, 16 pages. Nitrogen, A Major Impurity in Common Type I Diamond: by W. Kaiser and W. L. Bond; Physical Review, Volume 115, number 4, page 857; August 1959. Gems Made by Man: by Kurt Nassau, Gemological Institute of America, 191 pages, 1980. Many of the first attempts to produce diamonds in a laboratory resulted in diamonds with a yellow color. Consider that one nitrogen atom per several thousand carbon atoms can impart an obvious yellow color in a diamond. Then consider that nitrogen is the most abundant gas in the air of the laboratory. It was very difficult to keep the nitrogen out of the diamond growing process in the early days of lab-created diamonds. Today, producers of lab-grown diamonds have better controls over the diamond growing process and are able to exclude nitrogen or introduce it in just the right amount to produce a predictable yellow color. Yellow lab-grown diamonds are available and are priced at a significant discount to mined yellow diamonds.